What is impact? What does it mean for ECRs? This case study, by Charlotte Mathieson, focuses on Dr Laura King, a Postdoctoral Research Fellow whose work involves a number of public engagement activities. 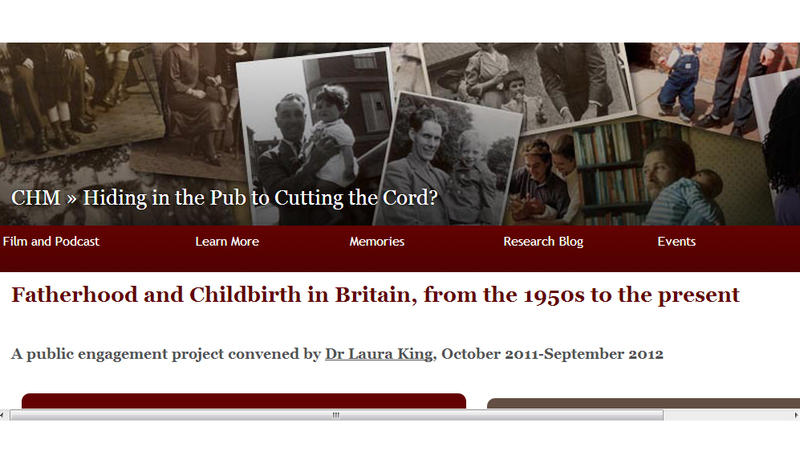 Dr Laura King is a Postdoctoral Research Fellow in the Centre for the History of Medicine, working on a research project titled “Hiding in the Pub to Cutting the Cord? Fatherhood and Childbirth in Britain, 1950s to the Present”. Laura’s PhD research, undertaken in the Department of History at the University of Sheffield, was on “Fatherhood and Masculinity in Britain, 1918-1960”. Following completion in 2011, she applied to become a Postdoctoral Research Fellow in the Centre for the History of Medicine at Warwick. The position, funded by a larger Wellcome Trust Strategic Award, was designed with a specific focus on public engagement. Laura used her doctoral research as a basis for her application but developed this to explore fatherhood and masculinity specifically in the context of childbirth, and updated the focus of the research to investigate the shift in fathers’ involvement in childbirth from the 1950s to the present day. The project aims to understand the reasons behind the changing role of fathers, the implications for parents, and the ways in which hospital policy and social attitudes have influenced behaviour. Public engagement is therefore integral to both the research process and the dissemination of outcomes. The first way in which the public can get involved is through a questionnaire which asks parents about their experiences of the father’s presence and involvement at the birth of their children. The questionnaire has generated some diverse responses that Laura will use in developing her research. Public engagement has also been achieved through a series of events relating to the research topic. Laura worked as a historical consultant on “Our Fathers”, a performance by Babakas Theatre which explores different aspects of fatherhood. Laura organised two panel discussions to accompany the performances at Warwick Arts Centre in June 2012, which bring together academics, fathers’ organisations, writers and the performers to explore the historical changes around the concept of fatherhood, and meanings and perceptions of fatherhood today. Laura has also worked on a poetry project with the publisher Nine Arches Press. Two poetry-writing workshops for fathers were held at the University and at a playgroup, and a collection of the resulting poems will be published by Nine Arches. The publication will be accompanied by a reading at the Coventry Mysteries Festival in June, and a range of events and activities to coincide with Fathers’ Day. Finally, a conference “Understanding Parenting: Historical and Contemporary Perspectives” will bring together practitioners, policy-makers and researchers of parenting to discuss how research into the history of parenting can inform public policy. Throughout the project, Laura has made use of a blog and Twitter account to keep readers informed of progress on the project and to interact with contemporary debates, news and events. The project has provided valuable experience for Laura’s development as a researcher: Impact is becoming increasingly important in academia and many job applications now require experience of public engagement. She’s developed specific media skills such as designing a website and using a twitter account for academic purposes, and Laura would now feel confident in setting up future research projects with a public engagement focus. Laura also feels that Impact activities can be personally beneficial and motivating for early career researchers. Whilst some researchers might be put off an academic career by the perception of the “ivory tower” of academia, public engagement brings about demonstrable changes to individuals in the wider world: “it’s fantastic to know that you’re making a difference and having a real change on the way people think”, Laura says. Laura has learnt a lot from this project about how to design and develop public engagement initiatives. From October 2012, Laura will be starting a new position as an Arts Engaged Postdoctoral Fellow, with a specialism in working with the Creative Industries.